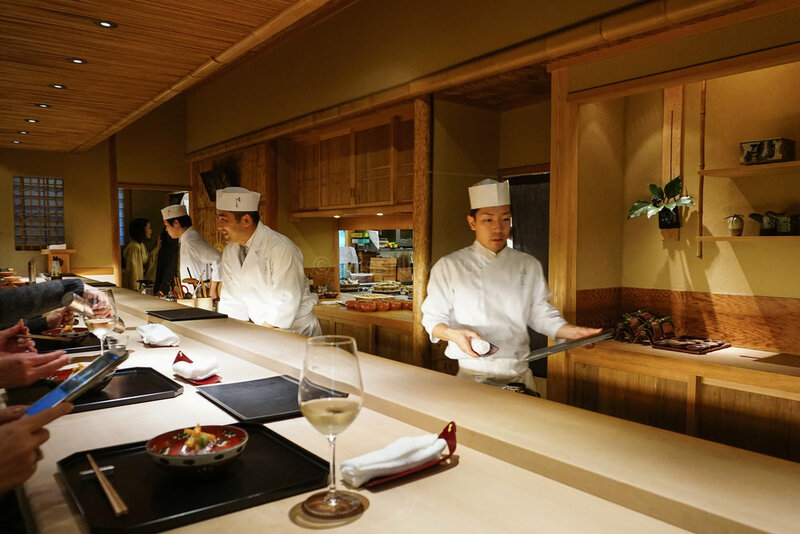 Ninshikawa is a 2-star Japanese restaurant in Gion area, it is within walking distance to the Kiyomizu-dera (清水寺). Chef Nishikawa-san (西川正芳さん) is only 38 years old. He opened his own restaurant followed by his name in Gion at the young 5 years ago after being trained at the renowned 祇園さゝ木 and honed his skills at 祗園花霞. 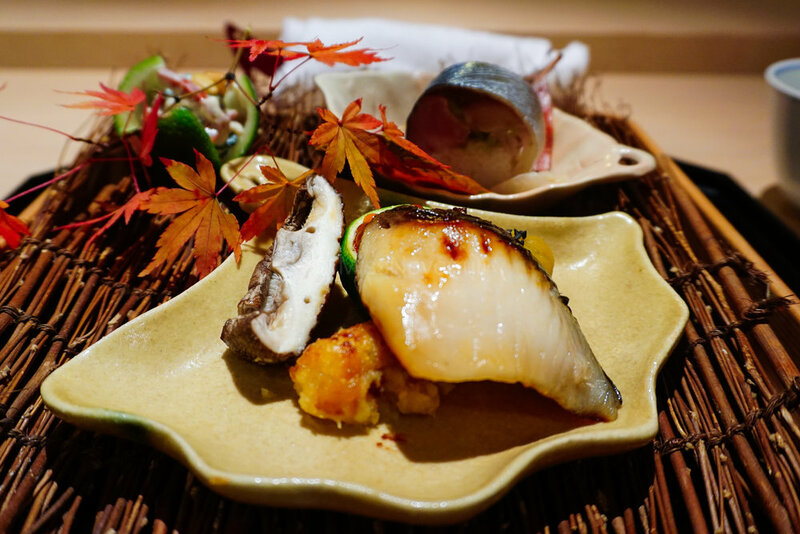 Nishikawa-san is the third generation from a family that runs mountain ryokan, so that he certainly knows about rare natural ingredients and cook them in his unique way. 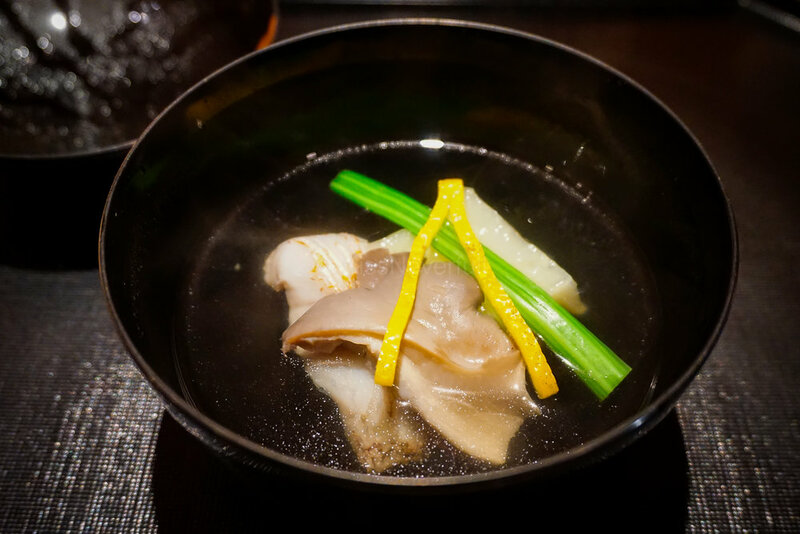 Very delicate appetizer to start with- the sea cucumber is fresh and tender, the chewy texture ends up a bit sweetness. 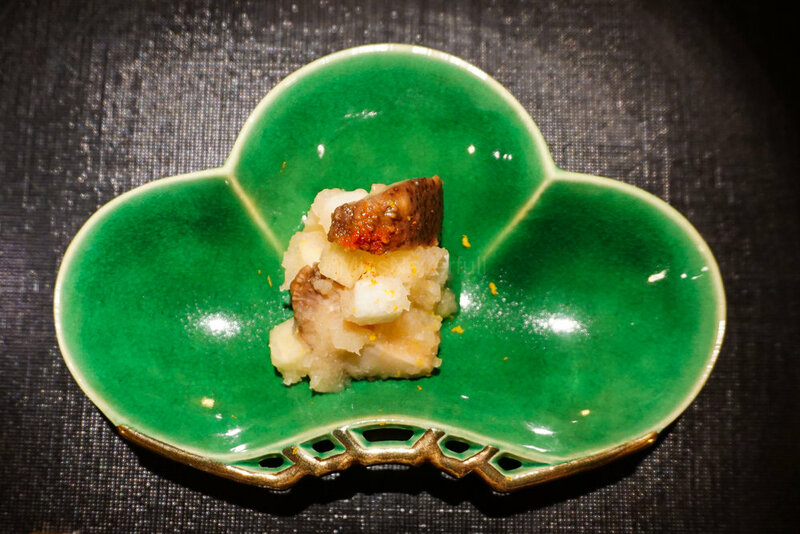 The yuzu simply brings a bit more freshness to the dish. The clear soup in most of the top Japanese resutants is always simply good. The grilled sea bream is very tender and full of char-grilled smelling, which intensify the flavor of the soup. Love the touch of yuzu again. The buri is lightly seared, but the inside part is still uncooked. 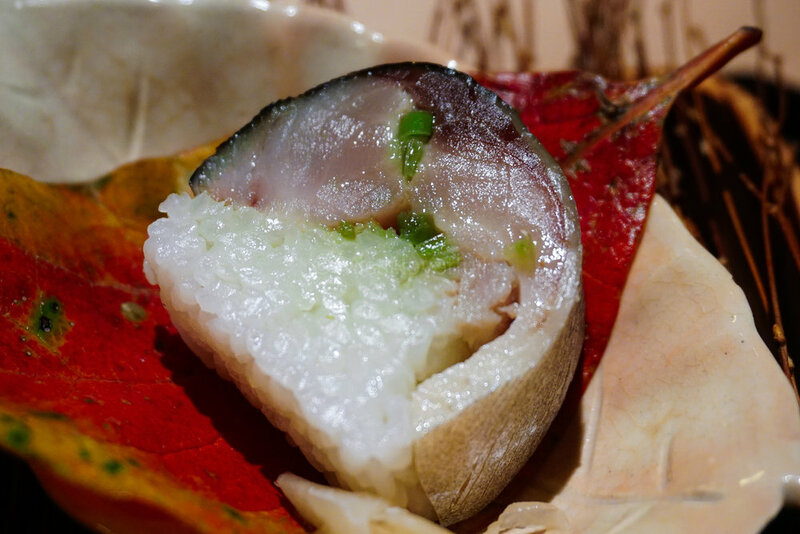 The buri itself is really tender and watery, the melon on the top is so soft and melted with the buri in my mouth. The sweetness from the melon perfectly balanced the sourness from the vinegar sauce. The cod on the bottom is quite hard to divide into smaller pieces, which expected to be tender. I think here the chef uses dry-grilled for purpose, but i personally doesn't like the tough texture of the cod. The miso paste on the side is actually really good. The saba sushi is really good as well, the saba on the top is lightly vinegared, with a bit spring onion and wasabi in between the shari and saba. This dish is really really amazing! I don't like fried food too much but this one is fantastic. The skin of the fried taro is crispy, but inside is so soft and smooth, and very strong flavor of taro. 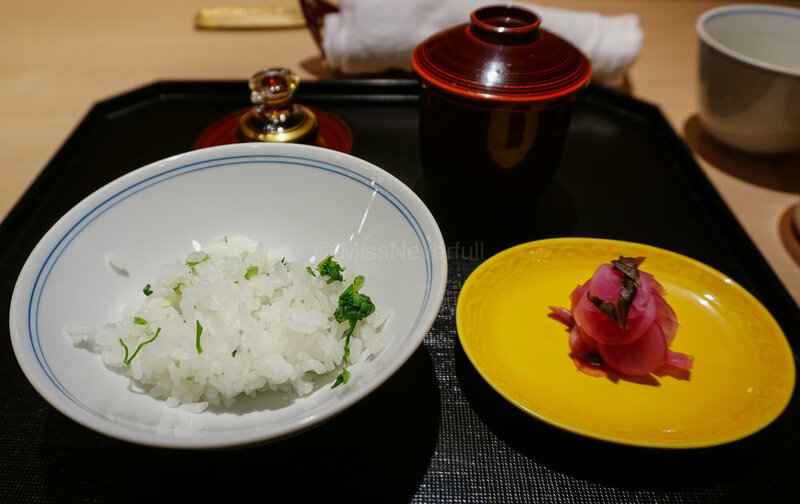 Nothing special about the flavor of the rice, but it is interesting that the chef gave each table a small container of soy sauce to serve with the rice. Usually Japanese doesn't like any sauce to get touch with their rice. I prefer the rice with soy sauce in this cause because the lily bulb and vegetables taste kind of boring. Warabi-mochi is made of sticky rice flour, it is sticky but the good ones won't stick on your teeth nor the fork, such as this one. Comes together with matcha sorbet to balance the sweetness of the mochi. However, to be honest, i think the service is not very good compare to restaurants in the same level. Probably because i'm a foreigner? The chef and the server in the main dining room cannot speak English, so it is kind of hard for me to understand the course. So i requested to get the handwriting menu, and they just photo copied one for me.